Image caption Tha an siostam air soirbheachadh ann an Israel agus ann an Dùthaich nam Bascach, le taic is stiùireadh riaghaltais. Tha eòlaiche air an dòigh teagaisg Ùlpan den bheachd nach bi an cùrsa soirbheachail ann an Alba mura tèid na h-uairean san t-seachdain a tha an cùrsa a' ruith a leudachadh. Tha Ùlpan - a th' air a lìbhrigeadh le companaidh phrìobaidich Deiseal Eta - na phàirt de ro-innleachd Bhòrd na Gàidhlig gus amas gum bi 65,000 neach-labhairt Gàidhlig ann an Alba ro 2021. Chaidh còrr air £1m de dh'airgead phoblach a chosg air thuige seo. A thuilleadh air tuilleadh uairean teagaisg, tha an t-Oll. Ruairidh MacIlleathain cuideachd den bheachd gu bheil feum air fada a bharrachd maoineachaidh. Tha e ag ràdh seo agus aithisg air a' chùis ag ràdh gu bheil dìth chothroman Gàidhlig a bhruidhinn taobh a-muigh a' chlas, agus nach eil sgilean sgrìobhaidh sam bith a dhìth air na h-oidean, na chnap-starra dhan t-siotam. Bha an rannsachadh a' coimhead air beachdan an dà chuid luchd-ionnsachaidh agus oidean. Chuir an t-Oll. MacIllEathain uine seachad a' rannsachadh Ùlpan ann an Israel, Dùthaich nam Bascach agus anns a' Chuimrigh. "Tha e air aithneachadh aig ìre eadar-nàiseanta, ma tha thu airson tighinn gu ìre fhileantachd, dh'fheumadh tu 's dòcha 1,200, no 1,500 uair de thìde a bhith agad sa bhliadhna airson fileantachd a ruigheachd," thuirt e.
"Ann an Israel, agus ann an Dùthaich nam Bascach, bha iad a' teagaisg trì no ceithir uairean de thìde gach là - an àite trì no ceithir uairean de thìde gach seachdain. "Bha iad ag obair air siostam far an robh thu a' faighinn eadar 20 agus 25 uairean de thìde san t-seachdain airson sia mìosan, no airson bliadhna airson an cànan agad a thoirt air adhart. 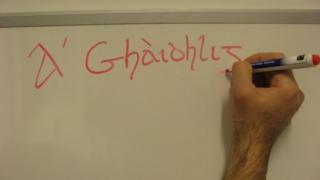 "Le sin, leis na h-uairean a th' ann an-dràsta (leis a' Ghàidhlig) chan urrainn dhut ìre fhileantachd a ruigheachd. "Bheireadh e bliadhnaichean mòra airson 1,200 uair de thìde a chur a-steach air a' chùrsa seo. "'S e cnag na cùise, càite a bheil daoine a' dol a dh'fhaighinn nan uairean sin anns an t-seachdain? "Ann an Israel, 's e daoine a bha a' tighinn a-steach dhan dùthaich, agus bha aca ri cànan ionnsachadh airson faighinn air adhart anns an dùthaich. "An Dùthaich nam Bascach, tha mi a' smaoineachadh nuair a bha mise ann, bha seo airson daoine os cionn 16 bliadhna de dh'aois, agus 's dòcha a-mach à obair - 's le sin 's e dòigh mhath a bh' ann airson ùine a chur seachad agus rudeigin a dhèanamh, agus bha an tìde aca. "Ach tha e doirbh do dhaoine. 'S dòcha gum bu chòir coimhead cuideachd air cùrsaichean air-loidhne, far am faod daoine a bhith ag ionnsachadh sna h-uairean aca fhèin far a bheil e a' freagairt nas fheàrr dhaibh. "Agus tha cùrsaichean fìor-mhath air-loidhne," thuirt e.
Nas duilghe ge-tà, tha a bhith a' faighinn cothrom Gàidhlig a bhruidhinn taobh a-muigh chlasaichean, agus mòran de luchd-ionnsachaidh a' fuireach ann an coimhearsnachdan gallda. "'S e an fheallsanachd air cùlaibh Ùlpan, no dìan-theagasg, gum bi cothrom agad mar a chanas iad 24/7 cha-mhòr, a bhith a' cluinntinn agus cothrom agad air a' chànan," thuirt an t-Oll. MacIllEathain. "Ann an Dùthaich nam Bascach tha iad a' feuchainn ri ionadan foghlaim sa choimhearsnachd a chur air bhonn - uell, tha sin aca - far a bheil rùmannan airson teagaisg agus cothrom agad a dhol gu àite far am faod thu an cànan a bhruidhinn. "Agus tha fhios agam gu bheil na Cuimrich a' coimhead air sin an-dràsta. Tha iad airson ionadan mar sin a chur air dòigh anns a' Chuimrigh. "'S dòcha gur e sin aon rud a bu chòir do dhaoine smaoineachadh mu dheidhinn san dùthaich seo. Seòrsa, chan e "Highlander's Institute" ach rudeigin coltach ris anns gach baile far a bheil fios agad gum faigh thu 's dòcha cupa cofaidh agus cuideigin ann a bhruidhneadh Gàidhlig, cho math ri rùmannan airson a bhith a' teagaisg a' chànain cuideachd. "Ach ann an Israel agus Dùthaich nam Bascach 's e an Riaghaltas a tha a' cur tòrr tòrr airgid a-steach dhan ghnothach, agus a tha a' riaghladh an rud cuideachd. "Le sin 's dòcha gu bheil àite ann airson Riaghaltas na h-Alba barrachd a dhèanamh a thaobh a bhith a' riaghladh an rud," thuirt e.
Tha aithisg an luchd-rannsachaidh a' dèanamh soilleir gu bheil an dòigh-teagaisg a' còrdadh ri luchd-ionnsachaidh. Ach tha i cuideachd a' sealltainn gu bheil e gu math duilich an cùrsa a lìbhrigeadh, agus duilich àireamhan luchd-ionnsachaidh a chumail suas gu deireadh a' chùrsa. Tha 144 aonad-ionnsachaidh an lùib a' chùrsa, agus 's e glè bheag a th' air an dèanamh uile - 50 duine ann an 2013. Am measg nam molaidhean a tha an aithisg a' dèanamh, tha gum bi e riatanach gum bi sgilean sgrìobhaidh aig a h-uile oide, 's gum bi e nas fhasa measadh a dhèanamh air èifeachdachd a' chùrsa. Mholadh cuideachd gum brosnaicheadh na clasaichean còmhradh am measg oileanaich, gach cuid anns na leasannan le a bhith a' cur air adhart choinneamhan neo-fhoirmeil far am faighear air a' Ghàidhlig a bhruidhinn.